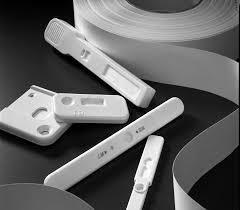 We are offering cost-effective rapid diagnostic test uncut sheet to support unique manufacturing needs. These uncut sheets can be cut into strip, for cassettes and for the midstream. Our factory can supply lots kinds of rapid test sheets. We sell uncut sheets in two most common sizes (60mm or 80mm). Special testing items, sizes, line placements and spacing can be produced upon customers request. 1 Good profit. Factory price; saving the shipping cost; saving the import tax as the materials. 2 Build up your own factory and being the manufacture. 3 Repack in your country and provide what you want. 4 Vacuum package can protect the effect of moisture.